Keeping your Windows 8, Windows 10 computer clean is mandatory if you want it to run smooth for a long time. This healthy habit should be implemented by every computer user in the world, not only by those that have the latest Windows. Regardless of the fact that they only use their devices occasionally, and even further, regardless of the device itself, be it a mobile phone, a workstation or a personal computer; they all need to be cleaned. Of course, I’m talking here about cleaning your computer at a software level (although, keeping the hardware clean is also mandatory) and what this means is cleaning registry entries, uninstalling unused programs or deleting temp files to free space. There are a number of apps that allow you to do this, but when it comes to Windows 8, Windows 10 computers, few of them are better than CCleaner, which, unfortunately, works only as a desktop application. CCleaner Windows 10 won’t boot – In some cases CCleaner might cause certain problems with your Windows 10 PC. Speaking of problems, several users reported that Windows 10 won’t boot after running CCleaner. CCleaner won’t start, install, open Windows 10 – Several users reported that CCleaner won’t start or open on their Windows 10 PC. In some instances users weren’t able to install CCleaner at all. CCleaner Windows 10 not working – Users reported that CCleaner isn’t working on their PC properly. This is a minor problem and it can be fixed by reinstalling the application. CCleaner not running, hangs Windows 10 – In several instances users reported that CCleaner hangs on their PC. In some serious cases users weren’t able to run CCleaner at all. CCleaner slow in Windows 10 – According to users, CCleaner can become slow on Windows 10. This is a minor problem but you can fix it simply by reinstalling the app. 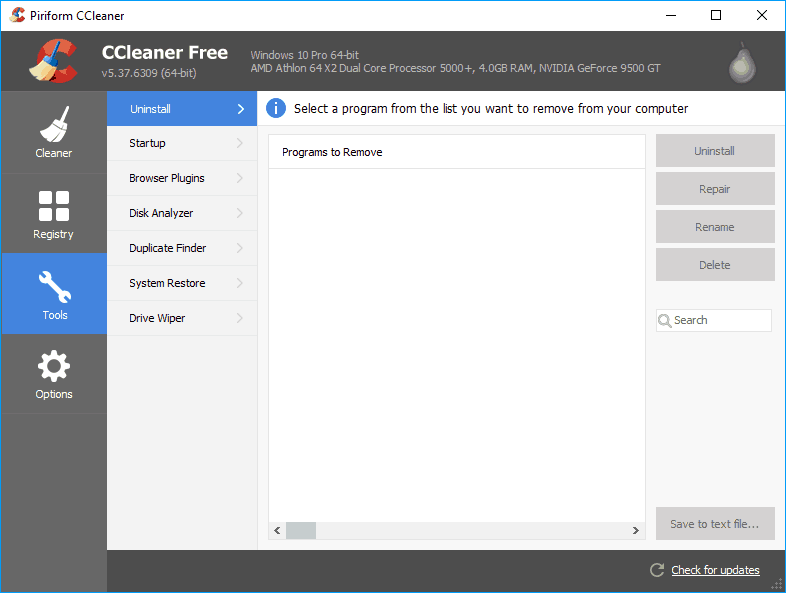 CCleaner uninstall Windows 10 apps – CCleaner comes with an interesting feature that allows you to uninstall Universal apps. This can be rather useful since you’ll be able to uninstall apps with just a single click. 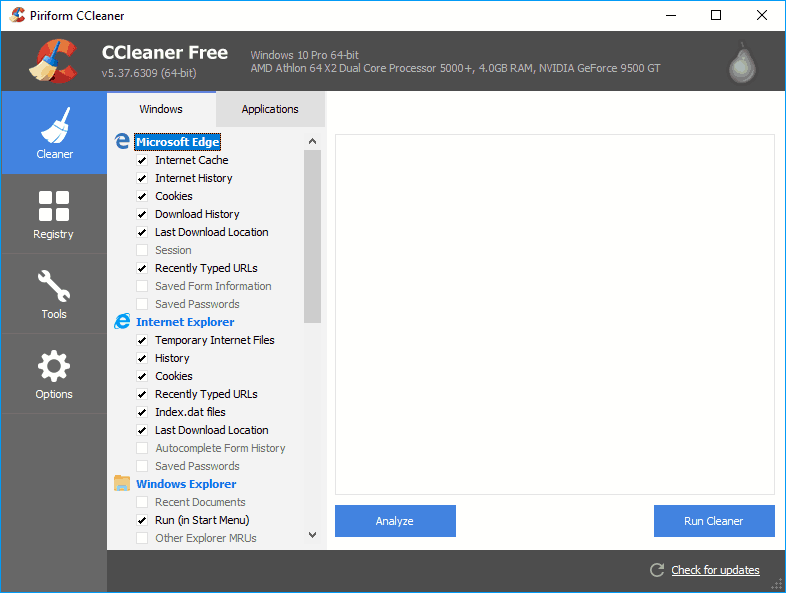 CCleaner is a Windows 8, Windows 10 desktop application that is used by thousands of users to keep their computer in shape and get rid of useless junk files that are left all over the place. 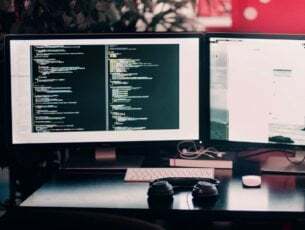 If you’re looking for more tools similar to CCleaner, we advise you to check some of the best tools to delete junk files that we covered recently. As for CCleaner, it makes your computer run faster, as it deletes multiple files that would have otherwise slowed search results and occupied a lot of RAM and it also gives users more space on their hard drives. Keeping your hard drive clean is important, but you shouldn’t neglect the heath of your hard drive. We wrote about best HDD health software in one of our previous articles, so be sure to check it out. At first, you might think that it can’t free up that much space, after all, the temp files and other small documents and registry entries don’t occupy that much, but keep in mind that they pile up after some time, and they might end up occupying a space of a few GB, which is not at all negligible. The program itself is pretty simple, having a simple interface that can be followed by anyone with no effort. As a Windows 8, Windows 10 cleaner, it cannot miss from your computer and by running it on a tight schedule, you ensure that your computer is always at its best. The first part of the program is the actual Windows 8, Windows 10 cleaner which scans all your Temp folders and applications. If you wish to run CCleaner for Windows 10, Windows 8, all you have to do is click the “Analyze” button and it will start searching for the files that are no longer needed. After the analysis is complete, you can run CCleaner and it will delete them. The next part of the app is the Registry Cleaner which scans every registry entry and filters the ones that are no longer in use. Keep in mind that every program you install on your computer creates a number of registry entries and once you’ve uninstalled the program, these remain on your computer and over time, it impacts the performance of your Windows 8, Windows 10 device. Running CCleaner to clean your Windows 8, Windows 10 registry is a great way to make your computer run faster. 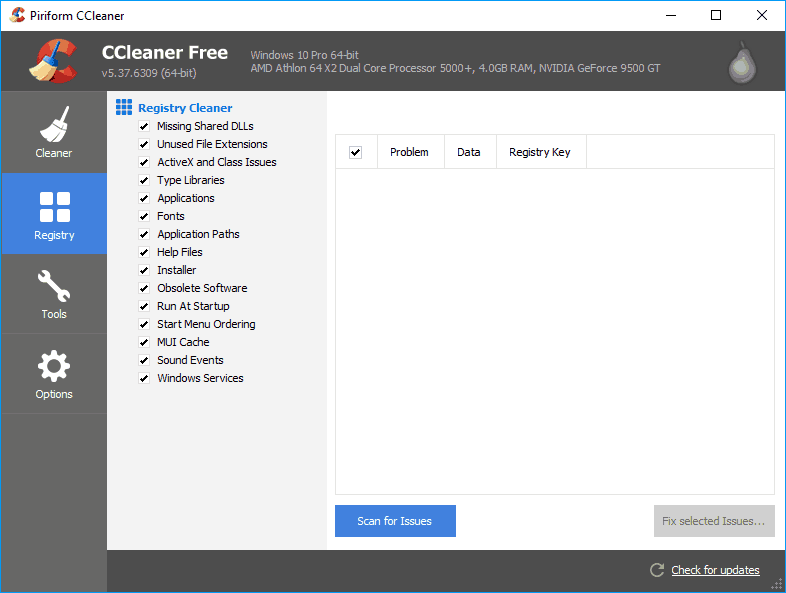 CCleaner offers solid performance in terms of registry cleaning, but if you want a dedicated tool to clean your registry, be sure to check out best registry cleaners for Windows 10 that we covered recently. In the Tools section users have at their disposal a number of useful features, such as a software uninstaller, which is similar to the default Windows 8, Windows 10 uninstaller, startup manager which allows users to select what services start with Windows 10, Windows 8 (by having fewer apps running at startup, your computer will start faster). 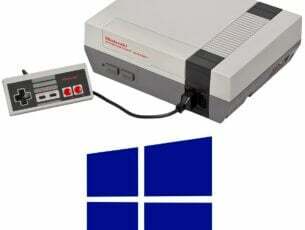 Additional features include file search, which is basically a search box like the default system search, system restore function that allows users to restore to a previous point if something no longer works properly and a drive wiper that allows users to scan and clean free space or completely wipe a drive. CCleaner is a solid tool for hard drive cleaning, but if you want a dedicated tool to wipe your hard drive, you might be interested these hard drive eraser tools. If you don’t see the reason why empty space should be cleaned, then you should know that it is not, in fact, clean. There are bytes of information left over from the previous files that were there, and even if your computer sees it as empty, it is not. Cleaning can result in getting more free space or in an improvement of the functioning of your Windows 8, Windows 10 computer. 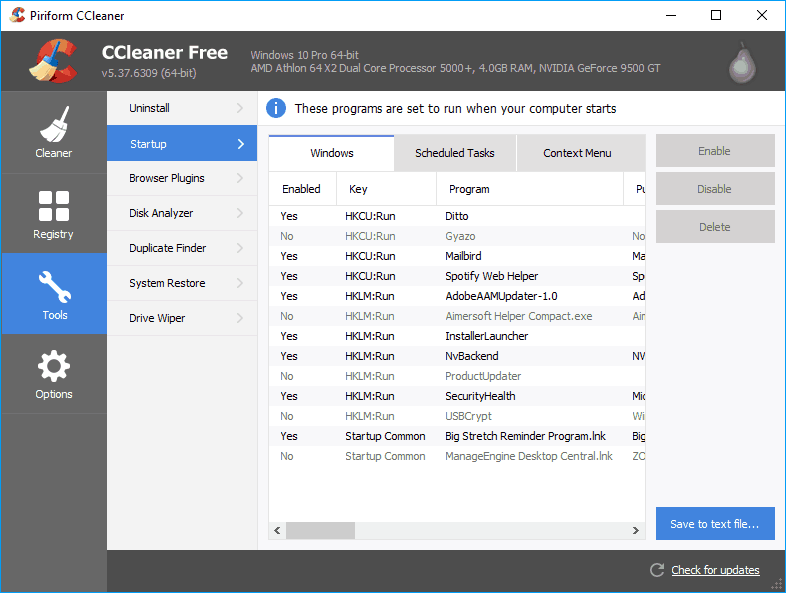 As you can see, CCleaner for Windows 10, Windows 8 offers users a host of features that allows them to keep their computers clean and running smooth. However, I do recommend that you do 2 or even 3 passes when you clean your Windows 8, Windows 10 computer, as some files might not be picked up the first time around. All this being said, we highly recommend that you use CCleaner on your Windows 8, Windows 10 computers. It is an awesome program and it is also free. For more advanced utilities upgrade to professional. Editor’s Note: This post was originally published in March 2013 and has been since completely revamped and updated for freshness, accuracy, and comprehensiveness.